Cambridge, ON offers a place for people to prosper along the shores of The Grand River in Waterloo Region. 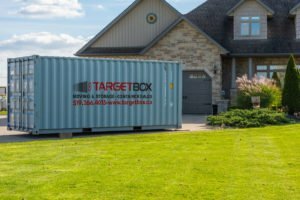 TargetBox provides moving & portable storage solutions to the residential & commercial market in Cambridge, ON. TargetBox offers convenient, safe and economical moving & storage solutions to Cambridge and surrounding areas. From our yard, located at 660 Fountain Street North, in Cambridge, ON, we provide shipping containers for rent and sale for the residential and commercial market. TargetBox can provide a mobile storage unit that fits your needs, whether you’re looking to rent or buy. Our selection of new and used shipping containers all come equipped with secure locks so your goods stay safe and dry. TargetBox storage units are available in three sizes and are weather and rodent resistant. We offer monthly rental contracts, so you are never tied down to a long-term commitment. 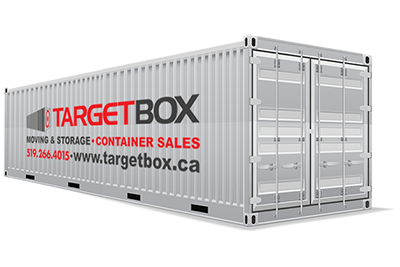 TargetBox is always an economical choice, whether you have short or long-term storage needs. We offer a variety of sizes and grades, whether you require a used storage unit that doesn’t need to be in exceptional shape or a brand-new container. Choose from our selection of types and styles, including Construction Grade, Good Shape (Used) and One Trip (New). Let TargetBox take the stress out of storing your belongings when you move. From our container yard in Cambridge, we provide simple and affordable storage solutions for all your household items. TargetBox moving units are a convenient and affordable choice for your next move. We deliver your moving container wherever and whenever you need it, and will pick it up and move it when you are ready. Take your time packing, avoid the stress and expense of dealing with a moving company, and feel confident that our secured container units will keep your household items safe and dry. Our portable storage containers come in three convenient sizes. The contents of most two to three-bedroom homes will fit into our 20′ units, while our 10’ units are perfect for an apartment or smaller home. Need more space? Ask about our 40′ container unit, which provides plenty of space for even the largest home or renovation. No room to keep your storage unit at your property? We can store it at our secured storage yard. 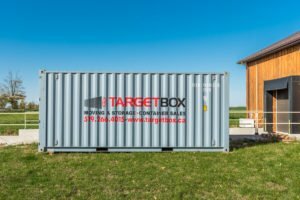 If you need temporary, portable storage for your job site or construction project, TargetBox offers a convenient and economical solution. 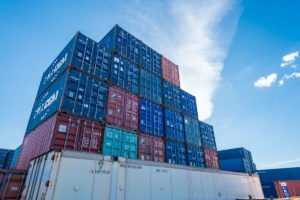 We offer new, used and construction-grade container units to the commercial market in Cambridge, ON, and surrounding areas. 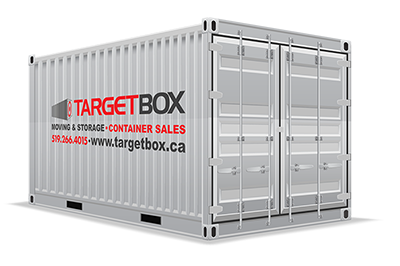 TargetBox provides a safe, economical storage solution, whether you require seasonal storage or need to expand your inventory without committing to more permanent space. Our units are moisture resistant units so you can store your goods and equipment in a place that’s safe, dry and clean. TargetBox works with you to find the storage solution that meets your need for security, space, and budget. If you are facing a space restriction, a portable storage unit can help you grow at a price that can’t be beaten by traditional warehousing and other storage alternatives. All our shipping containers come equipped with hardwood floors and operable doors. Our shipping containers are designed and built using 8-gauge steel so they are wind, water and fireproof. Most of our containers are available in stock and can be delivered to your door within 48 hours, depending on the level of customization required. Questions? We’d be delighted to help you choose the best suitable steel container for your needs. Looking for something other than a standard shipping container? We can help. 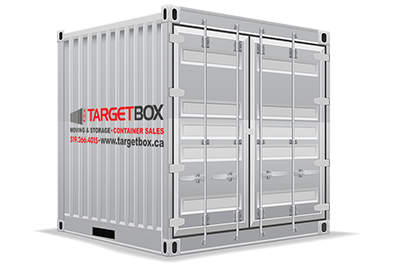 At TargetBox, we give you the choice of a wide range of ways to modify your container, whether it’s new or used. For example, you can add man doors, roll-up doors, windows, electrical and foam insulation. You can also add ventilation, painting, decals, custom interiors, office outfitting and lockboxes, or request custom modifications. TargetBox offers convenient, safe and economical moving & storage solutions to Cambridge and surrounding areas. 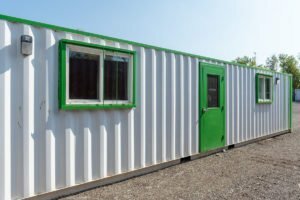 From our yard, located at 660 Fountain Street North, in Cambridge, ON, we provide shipping containers for rent and sale for the residential and commercial market. TargetBox can provide a mobile storage unit that fits your needs, whether you’re looking to rent or buy.